Welcome to the first poetry page of the re-launched London Grip. London Grip has been publishing exciting and original new poetry since 2008, under previous poetry editors Fred D’Aguiar and Robert Vas Dias and it is an honour to be following in their footsteps. Poems published in previous issues of London Grip are archived elsewhere on this site. This latest selection (which includes poems chosen by Robert Vas Dias before he relinquished the editorial chair) features work by fine poets from Canada, New Zealand and the USA as well as Great Britain. Readers will find poems in a variety of themes and styles; but they may be as intrigued as I was to observe how many of the contributing poets have chosen to deal in some way with children and childhood. to miss: a blank cartridge at close range can fracture the skull. by performing three magic tricks and holding a séance. if the top straw jumped once, that would be yes, twice meant no. The top straw jumped three times, baffling us all. and left an apprentice in charge of his calls. 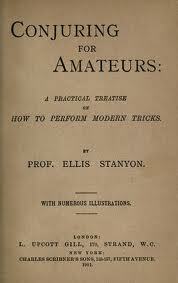 A Practical Treatise, by Prof. Ellis Stanyon. That word “practical” charmed me. inscribed in magnetic traces on a spinning disc? Chameleon Balls, and Sympathetic Ink. from a paper bag to boxes tied round a white rabbit’s neck. Bert Almon teaches a poetry masterclass with Derek Walcott at the University of Alberta. He has published eleven collections of poetry. and I suppose mice can swim. Rats can. ships in their efficiently executed rat-paddle. itself to be a very wet rat with excellent water skills. and the mouse beside her as collateral damage. and your hair streaming about you like wonder. forgotten fish flicker in and out of view. to gutter slowly into a green distance of trembling water weeds. faces in a photograph from an old yearbook. it is seared on a bed of pickled seaweed. shining in a familiar sky. James Norcliffe is a New Zealand poet. He has published six collections of poetry, most recently Villon in Millerton (AUP). He has also published a collection of short stories and number of fantasy novels for young readers, most recently the award-winning The Loblolly Boy published in 2010 in the US as The Boy Who Could Fly (Egmont USA) and its sequel The Loblolly Boy & The Sorcerer. His work has appeared in The Literary Review, the Cincinnati Review, The Iowa Review and many other journals. or too much time on our hands. like a maddening psalm. it tests my faith. something that was never there. Roddy Williams is a Welsh exile who now lives in West London. His work has been published in South, The Rialto, 14 and Obsessed with Pipework. His recent obsessions include infrared photography and Thai cookery. The statue casts a shadow in the square. And that their light may die. The Earth is not eternal. God makes bounds to His creation. He has touched an enquirer’s heart. In time Madonnas shall weep for him. A pitiless Inquisitor will smile. There is peace in the colonnades. The man of learning savours his wine. A beauty passes the window. It may seem the whole truth. That truth shall ever die. Geoffrey Heptonstall’s poems have been widely published – recently, for instance, in Adirondack Review, Decanto and Turbulence. He founded Cambridge Café Lit in 2005 and is a Contributing Writer at Contemporary Review. Time has slowed or I have slowed. or pedal that bicycle into the woods. I’m not used to the fullness of village life. This is what old age will be like. his skin is glazed to an unearthly shine. I observe more than one might suppose. The eye that’s central to this case is mine. One eye gleams like marble in the sun. My history determines who has won. The other shades itself as if in thought. He's in my sights. The very air is fraught. planning, no doubt, strategically to strike. How much are hidden enemies alike! like porcelain in pink and Sevres rose. And it is but a child of air/ Who lingers in the garden there. – Robert Louis Stevenson. Since her arrival on these shores in 1985, New York born writer, Leah Fritz, has had four collections of her poems published in Britain. Her next volume, ‘Whatever Sends the Music into Time: New and Selected Poems,’ will be published by Salmon in 2012.
persist, though he and they are underground. and he was slowly going blind, but wrote. by this time, what is left but marks on paper? in which the children crowded, to sing Handel? Merryn Williams was the founding editor of ‘The Interpreter’s House’. Her latest work is ‘Effie: A Victorian Scandal’ – the story of Ruskin’s wife. their fabrics claimed by dirt and fray. wither in a breath of thyme. Born in London, Sue Rose now lives in Kent where she works as a literary translator. She won the Troubadour Poetry Prize in 2009 and the Canterbury Poet of the Year competition in 2008. Her debut collection, From the Dark Room, is published by Cinnamon (2011). Mario Petrucci has been poet-in-residence at the Imperial War Museum and BBC Radio 3 and his poetry has won prizes in the Bridport, National and Arvon competitions. The poems published here are from his crib sequence which sits within a major modernist project entitled i tulips – one instalment of which was published by Enitharmon in 2010.
to feel a remembered touch on my skin. Award-winning poet Geraldine Paine has been published widely in magazines and anthologies. Her first collection The Go-Away-Bird was published by Lapwing Publications (Belfast) in 2008. I tried, several times to pass the man with the swaying walk. His legs flicked outwards with every step. Both had been amputated and the feet in the shoes that walked the pavement were not his own. A woman on the bus held her baby whilst she fed it. The baby’s eyes were starting to close and the woman shifted in the seat as if to make herself more comfortable before it fell asleep. Her left arm moved further under the child’s body, although in fact it was not her arm. At the fitness centre the man took my card and opened the file to enter the information. He held the right side of the file down with curved, static fingers that had never felt anything hot or cold or wet, or the love of another hand. The spring clean took ten days whether you rushed it or not. She started in the attic room. Under each bed she found soft down feathers. When she mopped the floors she stopped several times to deal with patches of bird droppings. On the first floor there were more feathers. One bedroom had a large wardrobe with a mirror. When she tried to clean it she realised that the white, erratic marks were not the leftover crayon marks made by the unsupervised child of a guest, but etched-in beak marks. The squiggly patterns started in the centre of the mirror and continued almost to the bottom. She used glass cleaner on them, then cream cleaner, and in desperation, salt. Her hand moved over the offending areas again and again and again. She caught sight of herself in the mirror, frown lines deep between her eyebrows, and moved on to do the dusting instead. On the wooden bedsteads and walls she found more bird droppings. They were smaller and looked more watery than the ones in the attic. A damp cloth wiped them away. On the seventh day she reached the master bedroom, their favourite room and the one they used when they came to stay. She checked the mirror on the wardrobe for marks, but there were none. She came to mop the floor on her side of the bed, the far side, exactly where she was in the habit of placing her feet to get in or out. There, in the narrow gaps around the chunks of pale parquet, were streaks of red that not even a toothbrush could remove. Elke de Wit is a writer, film journalist and actor. She was born in Liberia, grew up in Kenya, Tanzania and Hong Kong, and now lives in London. Her prose poetry / flash fiction has been published in Tears in the Fence.